With what is probably the biggest wedding of the last couple of years being just days away, we’re struck with wedding fever! Although you probably haven’t received a royal invitation, you may be attending the wedding of a friend or family member over the next couple of months. We know how difficult finding the perfect wedding guest outfit can be, but don’t worry, we’ve got you covered! Here’s a rundown of the wedding styles we love; you’ll look simply stunning, without upstaging the bride of course! In our opinion, the ultimate Summer wedding style is the floral bardot skater. It’s a gorgeous style that is flattering on so many shapes as it emphasises the smallest part of your waist! The bardot shoulder detailing adds a glamorous touch, but is still subtle and elegant. 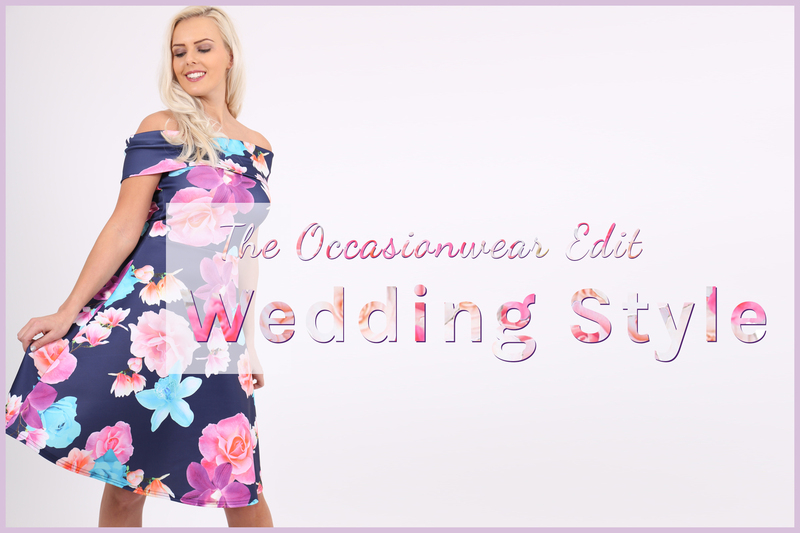 Floral prints are perfect for Spring and Summer, and are a great option for weddings as you’re very unlikely to match the bride and her bridesmaids! All of our floral bardot’s are perfect for a wedding, but our three favourites are Navy Elizabeth Bardot Skater, the Selenis Yellow Bardot Skater and Navy Elondie Bardot Skater. Navy blue is one of the hottest colours around at the moment; it has all the elegance and glamour of black, without being too contrasting and bold! We’d recommend pairing any of these dresses with white shoes and accessories to complete the look. An alternative, and completely contrasting, style option to go for is the block colour bodycon. Bodycon dresses are great for formal occasions as the figure-hugging shape is super glam and sophisticated. We love block colour bodycon dresses for an elegant look! Three gorgeous options are the Pink Velvet Sorento Bodycon, the Navy Fiona Bodycon and the CURVE Pink Fishtail Hem Peplum Dress. The dusky pink and navy shades are huge this season, and so any of these dresses will have you bang on trend! We’d suggest pairing either of the pink dresses with white or metallic accessories, including that all-important fascinator. The Navy Fiona Bodycon can also be paired with white or metallic accessories, however we’d suggest matching it with a contrasting pastel colour to amp up the vibrancy of the look. Colours we love with this gorgeous navy number are mint green, lilac and baby pink. If you’re opting to pair your dress with metallic accessories, we have a selection of shoes that will complete the outfit perfectly! Go for ultimate glam in the Silver Sequin Strap Heels. The front of the shoe nails the ‘barely there’ trend, while the sequin embellishment on the back of the provides subtle statement sparkle perfect for formal occasions! Add glitz to your look with the Silver Shimmer Buckle Heels. With the shimmer fabric and extra diamantes, these shoes are the perfect party shoes! If heels aren’t for you, or you need a back-up pair of flats for the long day, our Gold Grecian Sandals are perfect! The stunning T-bar detailing adds that Grecian glam, and the elasticated ankle keeps the sandals super comfortable! All of our heels and sandals come in a variety of colours, so you’re sure to find the perfect match for your out! We want to see what you’ll be wearing! Make sure you tag us in your gorge pics using #WantThatTrend on Facebook and Instagram – there’s a chance you could be featured on our website, too!